CarMotive in Houston, TX keeps you rolling on top quality tires. 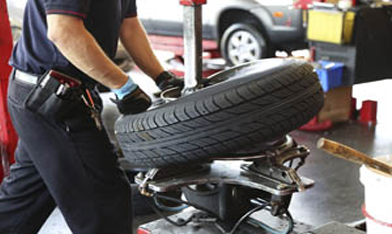 Our Mechanics use our excellent inventory to equip you with the best tires for your driving needs. The correct selection of tires will improve your vehicles performance, and with our routine tire rotations you’ll get the most out of your tire purchase. A good rule of thumb is to rotate tires every time you come in for an oil change. If your tires’ tread is worn down too low, your safety on the road will become compromised. Our premium quality tires allow you to grip the road, improving your vehicle’s handling and stopping power. Always be prepared for inclement weather conditions by installing a fresh set of tires on your car. We offer a wide selection of name brand tires to enhance all of your highway travel. The helpful and knowledgeable mechanics at CarMotive will always steer you in the right direction. Your tires are one of the most important parts of your vehicle, yet many drivers overlook them until it’s too late. Keeping an eye on your tire’s condition will improve your driving comfort, gas mileage, road safety, and save your money. An off alignment will be evident in your tires as they wear unevenly. We can get you back on the road, riding on top of the best tires possible. Our aim is for you to get the most out of every tire, and that means providing you with the right tires. Your specific needs can be met by our premium quality tire inventory. Our tires are meant to keep you safe and keep you enjoying your vehicles handling. A new set of tires is like a new pair of shoes, or a brand new haircut. People can’t help but notice there’s something different. That’s what some new tires will do for your vehicle that looks good, usually drives good and a vehicle that drives well, drives safely. Let us get you looking good and drive safe by replacing any overdue tires on your car. We have the brands you’re used to and we have them at affordable prices. © Copyright CarMotive 2017. All Rights Reserved.